Ok, the moment has come. 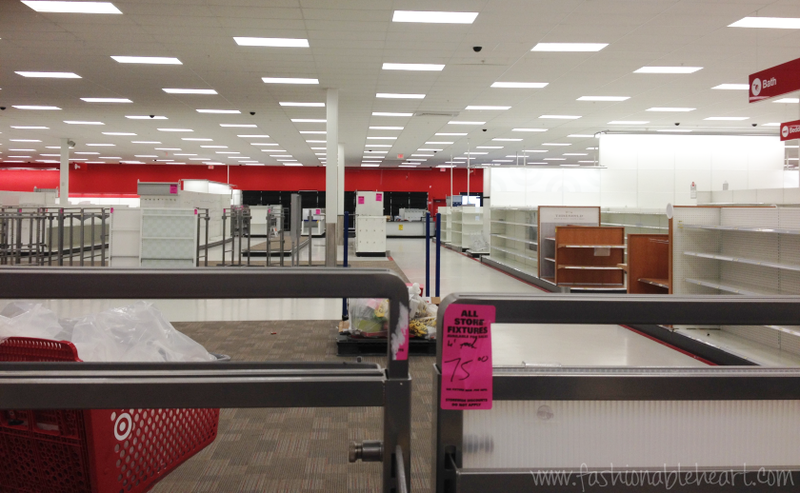 There are officially no more Canadian Target locations open. I contemplated not going, expecting not to find much except chaos. But I had luck the other two times I shopped the clearance sales at two other locations, so I chanced it. I went to the Stockyards location in Toronto around 1pm and there were still things left to look through. Not much, mind you. The whole store was barren. They put the merchandise that was left in about 30 estimated carts at the front of the store. I hated the system, because I don't enjoy the digging method. I had rather them put it spaced out on a few aisles like the Target I went to previously. Granted, I went days before they closed so they had more stock left. I was determined to not let my last trip to Target be a disappointment, so I persevered. It's amazing what people will buy just because it is on sale. Guarantee they will get home and never use half of the stuff they bought. But hey, it was 80% off! I used to be one of those people until I found myself donating so many things that were never used or still had price tags on them. I try to have a game plan now and I certainly try not to buy something that I would not buy if it were full price. I did luck out! I got the last two medium-sized dog collars for Indy and he's set for a good while now with this and what I got him in the last haul. These Maple Leafs car decals were sitting by themselves on a shelf near the registers and I love that they have a dog and cat on them! I don't care for the typical stick figures on cars, but it's Leafs and I'm married to a Leafs fan (and he picked them out!). The Sonia Kashuk eye duo was the last one in those colors, but there were still plenty of the big palette when I was there. A full matte palette that will work perfectly with all of the Naked palettes! Swatches will come on both palettes. So what did I get all of that for? $6.20. Every item in the haul was more than $6 before the clearance discounts were applied! Not too shabby. But I tell you, I'd take having my Target Canada still being open over these deep discounts any day. I refuse to give up hope that Target's online store will start shipping to Canada. They do still have fans here and I think it would be a smart move! 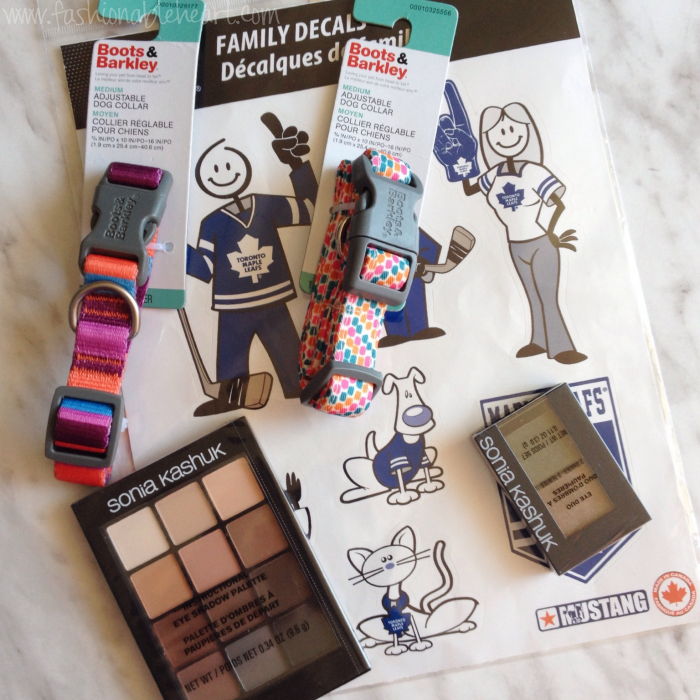 To read my other posts and hauls on Target Canada's closing sales, click here and here. Goodbye, my sweet friend. I think I shall miss my cute stationery, Archer Farms food, stylish home decor, Sonia Kashuk, fun accessories, and designer collections most of all. Guess it's time to renew my passport and get ready for a few border trips again! Wow, I can't believe how empty the store was! So, so sad. I was sad shopping there a couple of weeks ago, so I just couldn't go at the very end. I had such a hard time finding these palettes for my friends and now noone even bought them to the last day! Buh-bye, Target! Looking at that photo makes me wonder if they were also selling the shelves... LOL! They did!! All of the store fixtures, carts, everything - all on sale! Total liquidation, which made it even sadder to walk in on those last days. Seriously. It's like every single bit of stock that was lacking came out to play in the final weeks! My heart remains broken. </3 Wahhhhh!